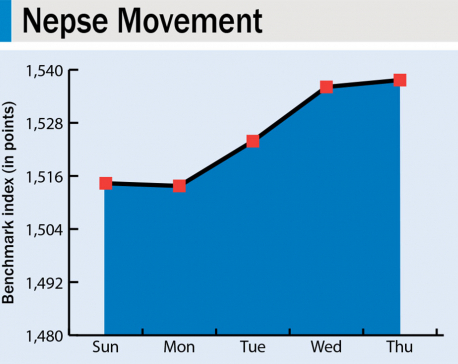 KATHMANDU, Jan 14: Nepal Stock Exchange (Nepse) index rebounded this week, gaining 32.41 points to close at 1,479.86 points on Thursday--the last trading day of the week following a long slump. Daily turnover, however, has not improved yet. The massive fall in daily turnover in recent weeks has been attributed to initial public offering (IPO), follow-on public offering (FPO) and rights issue by listed companies. As many investors have been pouring their money in the primary market, the transactions in the secondary market has dwindled by almost half. Investors have flocked toward the IPO of Samata Microfinance Bittiya Sanstha and FPO of Nepal Life Insurance Company Ltd in recent days. "The benchmark index has gone up by some points. But we have not seen any upward trend in the market yet. Instead, the daily turnover is declining because most of the investors are pouring their money in IPO, FPO or rights issue," Anjan Raj Poudyal, former president of Stock Brokers Association of Nepal (SBAN), said. 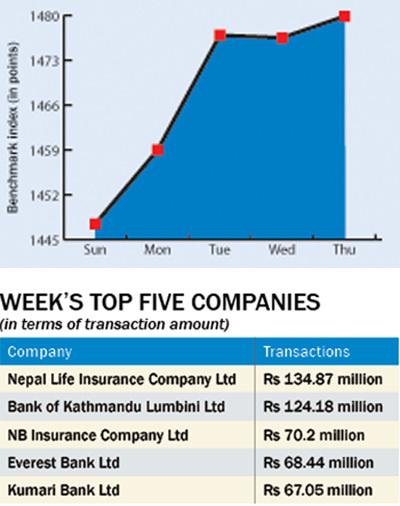 Until few weeks ago, Nepse was seeing average daily transactions of around Rs 1 billion. Now, average daily transaction has dropped to nearly half. Insurance sub-index was the biggest gainer of the week as its sub-index went up by 275.67 points to close at 6,934.8 points. Banking, the heavyweight trading group, also climbed 38.23 points to close at 1,418.2 points. Hydropower group also ended the week 28.49 points higher at 1,747.22 points. The Finance sub-index also went up 25.62 points to 710.58 points. The 'Others', and Manufacturing and Processing groups also inched up 1.44 points and 0.34 point, respectively, to close at 732.58 points and 2,102.78 points. Hotels group, however, lost 41.63 points to close at 1,864.94 points. Development Bank sub-index went down by a marginal 0.26 point to 1,518.93 points, while the Trading sub-index remained unchanged at 205.03 points. A total of 10.33 million units of shares of 148 companies worth Rs 1.74 billion were traded in the market this week through 13,140 transactions. 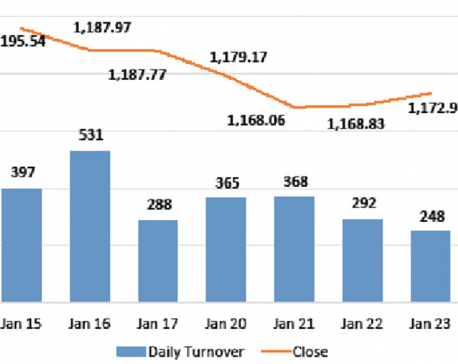 The turnover is 19.74 percent lower compared to week. Standard Chartered Bank Nepal Ltd (SCBNL) has announced that it float launch FPO at Rs 1,290 per share as part of its plan raise paid-up capital. According to a letter sent by the SCBNL to the Nepse, the foreign joint venture bank will launch FPO with a premium of Rs 1,190 per share on the par value of Rs 100. The bank is issuing 2.56 million units of shares to raise Rs 3.3 billion from the market. "In order to comply with the regulatory requirement to increase the minimum paid-up capital requirement for Class 'A' banks in Nepal to Rs 8 billion, the 347th meeting of the board of directors held on 19 October 2016 had unanimously approved to issue new shares by way of further public offering to the general public at a premium to meet the capital requirement prescribed by the Nepal Rastra Bank," the bank said in a statement.